On the last day of December, 2009 Kate Zambreno began a blog called Frances Farmer Is My Sister, arising from her obsession with the female modernists and her recent transplantation to Akron, Ohio, where her husband held a university job. 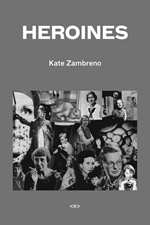 Widely reposted, Zambreno’s blog became an outlet for her highly informed and passionate rants about the fates of the modernist “wives and mistresses.” In her blog entries, Zambreno reclaimed the traditionally pathologized biographies of Vivienne Eliot, Jane Bowles, Jean Rhys, and Zelda Fitzgerald: writers and artists themselves who served as male writers’ muses only to end their lives silenced, erased, and institutionalized. Over the course of two years,Frances Farmer Is My Sister helped create a community where today’s “toxic girls” could devise a new feminist discourse, writing in the margins and developing an alternative canon.